New Website Launch of Get Army Strong! 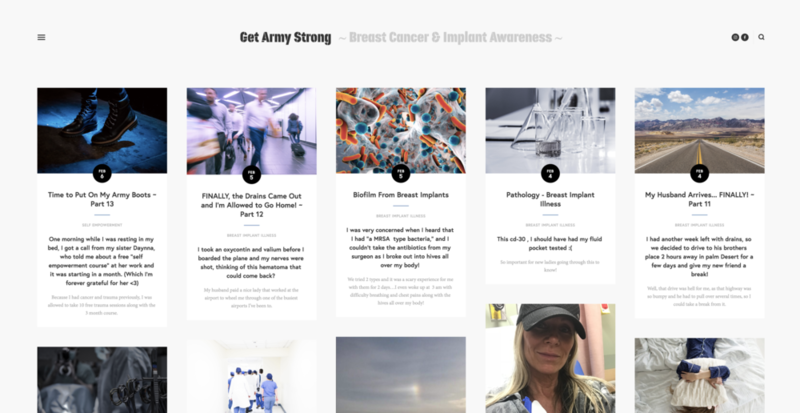 Donna Halme Designs designed a website for Get Army Strong which is a blog based website that brings awareness and empowerment to the many women fighting breast cancer and breast implant illness. The Get Army Strong blog tells Shannon Sayers story of the horrific and courageous journey of strength, her will to fight and stay strong through the setbacks she faced along the way. When I was approached by Shannon, listened to her story, I immediately wanted to help. She had a great passion to make sure this information gets out to readers. This was not easy for Shannon by any means, as she had to relive the negative emotions these stories surfaced when writing them. However, we agreed that this became a positive experience, one that helped as part of her healing process. I truly loved working on this project and hope that it helps those who have or are suffering with these illnesses find answers, hope, and inspiration in her blogs. Shannon had many photos that we put together with the various blog content she had. I started at the beginning of her journey and each blog tells her story with photos, many resource links, and videos. I created a special Resources page for books that have helped her, and videos about breast implant illness. Both a Contact and Contributor pages where created for those wishing to contact Shannon or interested in becoming a blog contributor. In order to get her blogs out to her subscribers, I integrated MailChimp which is a email RSS Campaign within her Squarespace website. This is a very special project, one that I’m very honoured to have been given.